This is one very old family recipe that I have finally tackled on my own, and I am so excited to say that I did it. I actually did it! 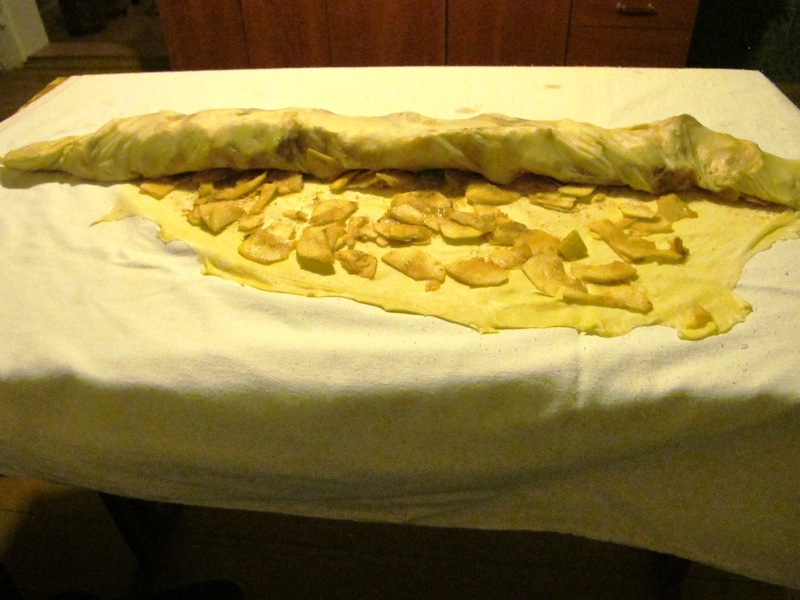 I made apple strudel with my own home made near paper thin phyllo pastry. I don’t think I’ve ever felt so triumphant baking something before. 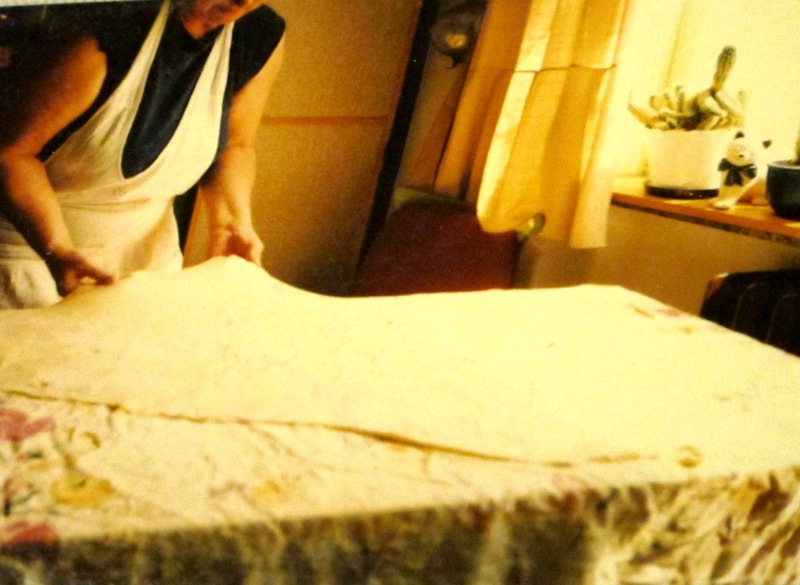 Pauline and I used to make it centuries ago at her dining room table, stretching and stretching the dough until it reached across the table end to end. It was so thin you could read a newspaper through it. Dada's perfectly stretched pastry. The edges will be trimmed with scizzors. Okay, so mine today wasn’t that thin, but it was close. And it didn’t exactly reach across the table end to end, but it did stretch quite far. For a first solo try I didn’t do too badly. When I attended a baking course at Le Cordon Bleu in Paris a couple of years ago, the French chef marveled at the women of Eastern and Central Europe who still made the pastry by hand, a dying art, he said. Well, I’m here to keep it going. Ok, so there were a few holes in my pastry. Hey, it was my first attempt! Nick sauntered by and pointed out that this was not an old tablecloth but a new one from France. Must clean it before he sees the stains. I apprenticed a couple of weeks ago with Dada, Pauline’s cousin, in Dolny Kubin, Slovakia and learned a few tricks. 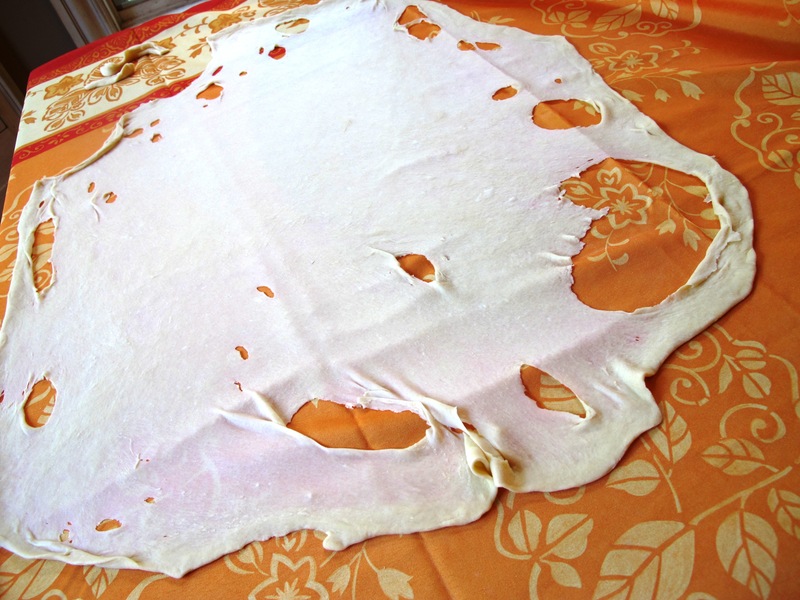 First, you need an old table cloth that is only ever used to make the strudel. 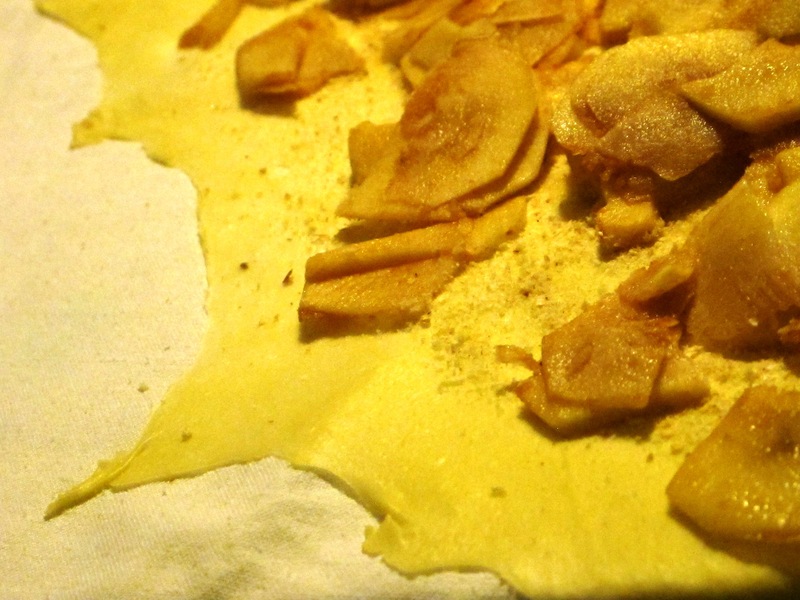 Dada’s is worn and pilled, which she informed me with a straight face that it adds texture to the strudel. When she was done making her pastry, the tablecloth was spotless. Mine was filled with crumbs and grease spots. Adds texture, I told myself. Dada uses apples that grow on trees in her front yard. Decades ago her house was moved from the forest where her mother grew up in it, and moved into the town of Dolny Kubin where she lives with her apple trees and 2 huge, ferocious sounding German Shepherd dogs. Left over apple cores are dried and used to make tea. 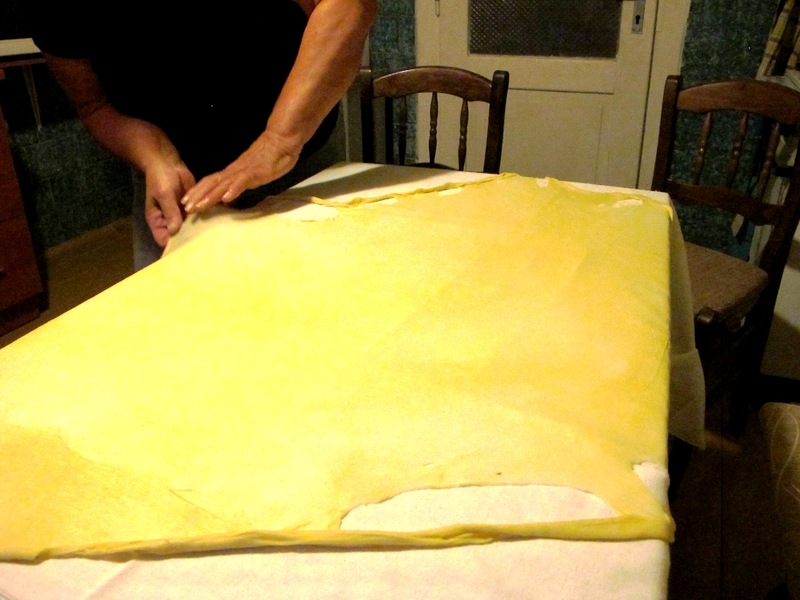 The dough that is clipped from the edges is used to make dumplings with in garlic soup. I think I was a little heavy on the crumbs. I also added walnuts. 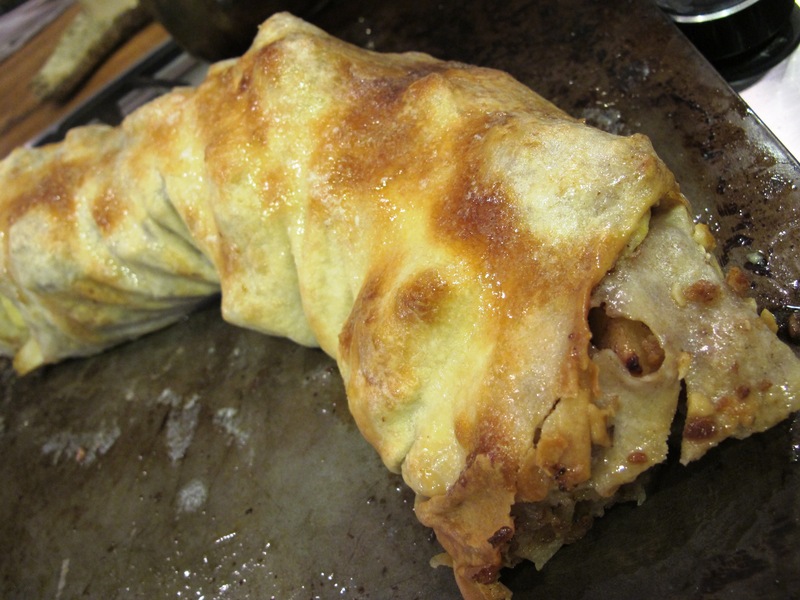 After eating a slice of strudel my son asked if there was meat in it. 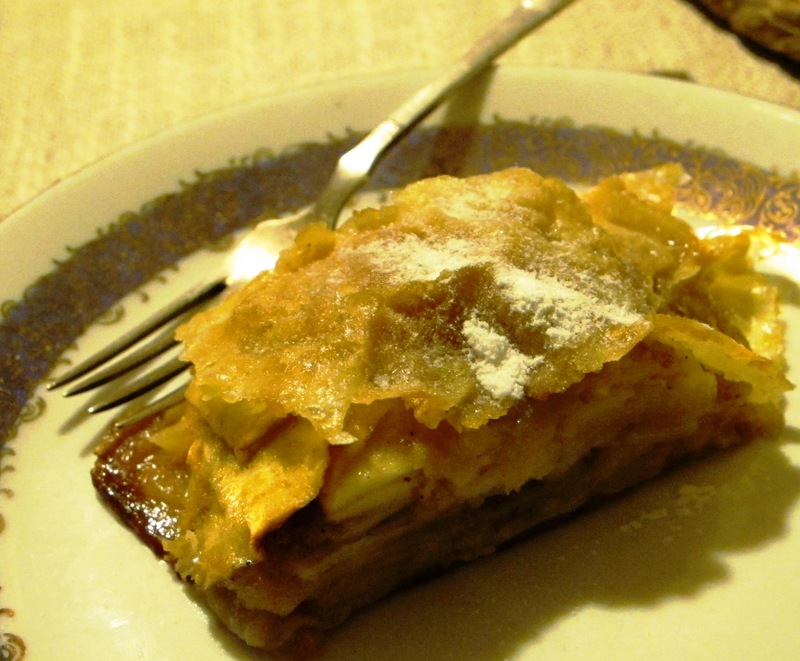 Dada bathes the baking strudel with melted butter and hot milk. 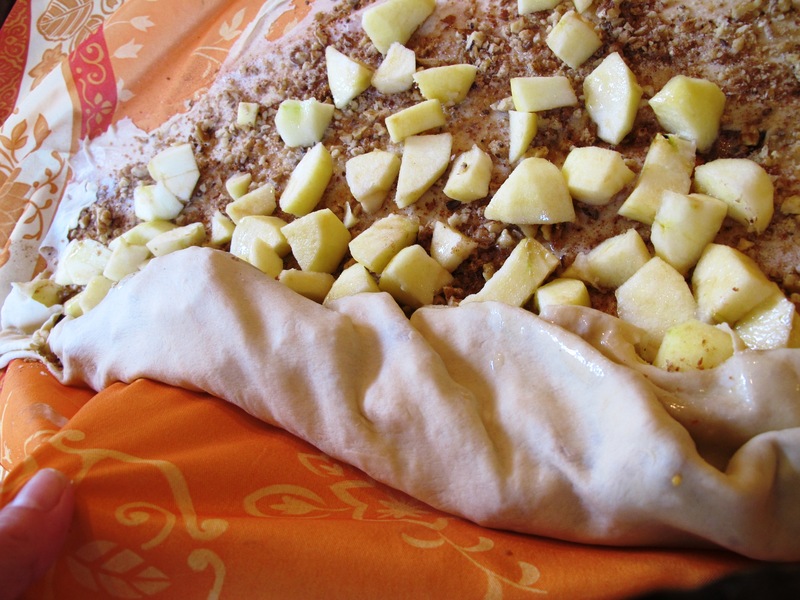 Flatten the mound of dough and place on the cutting board, and place the hot pot on top of it, covering it. Leave for 1/2 hr. My masterpiece. Not quite as flaky as Dada's. In fact, the pastry was a little tough. Hmmm... Next time I will have to try kneading less and using better flour. And stretching the pastry about twice as much. Proud of you Tonya! Don’t think I’m up to trying that. Oh, come on, we’ll try it when I’m up there next time. It really isn’t that hard, and is much easier with an extra pair of hands to help stretch. Pauline, thanks for for this fascinating website,I am a Slovak living in Florida. I escaped from Czechoslovak communist country in 1987. 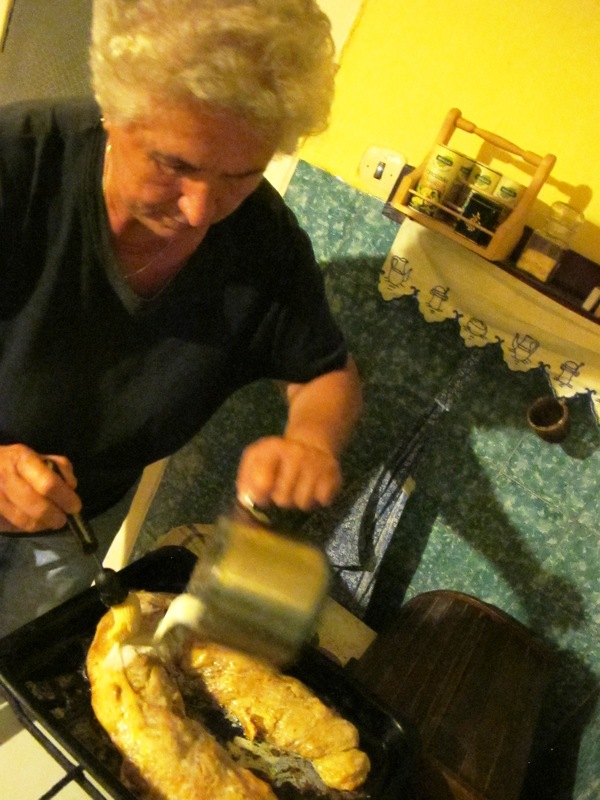 My wife from Dothan,Alabama can cook some Slovak food,but makes fantastic chicken paprikas. I subscribed her to this website,I hope she will like it. Thanks again. Thrilled to have found your site! Spent two weeks in Dolny Kubin while visiting family in Pribis. I still crave the food and am happy to have the chance to make something other than stuffed cabbage and chicken paprikash.